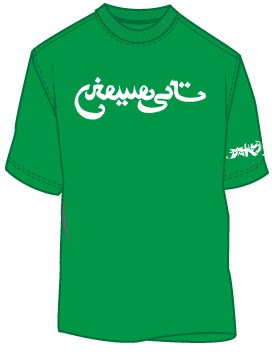 In solidarity with our own exhibit, "From the Streets of Iran", we're putting out this limited edition green tee, available in men's and women's sizes. Thanks to one of our favorite LA artists, HASTE CBS, for the magnificent faux-Farsi handstylez! They'll be up on the site soon...but for now you gotta be in LA at our opening and hope we have some left! But we do accept Paypal if you really have to have it!